Don’t get mad, get even. That’s what I decided to do when my seven year old son came home from a friend’s house telling me that he had learned some French. The Francophile in me beamed from ear to ear. “Disneyland Pareeeees!” he announced proudly. This was not the time for a lecture on cultural globalisation. It was time to show him one of the facts of life. Paris is not made of glittering castles or run by big-eared mice. (I resist the urge to digress at this point). But beating Disney isn’t easy – unless, like me, you have a child who loves his bike more than Bambi. “How about coming to Paris with me for a couple of days, I asked?” He beamed. “But No Disney”, I added. He frowned. “How about we go on our bikes?” I proposed hesitantly. He screamed. You do have to pay an extra £20 per bike on Eurostar, but a promise is a promise. (Borrow a Brompton and you take it for free, however). Next is finding suitable accommodation for the would-be yellow shirts. The school boys’ guidebook says that the only place to stay in Pareeeees this year is Davy Crockett’s ranch in, you guessed it, Disneyland. Huttopia, which sounds ironically like a Disney cartoon, is the perfect antidote. We had already spent a summer holiday at their woodland haven in The Loire and now we were ready to sample their wooden chalets in a forest in Versailles. What a wonderful feeling to board a train in South London, cycle along the Thames from London Bridge to the Eurostar terminal at Waterloo and arrive at Gare du Nord in time for lunch. We resist the temptation to pop into Monsieur MacDonalds and keep going on the RER to Versailles. This turns out to be the right decision, because when we get out at Porchfontaine, a small suburb of Versailles, there was the perfect Boulangerie and Charcuterie greeting us with open doors. The first French lesson of the day is to buy a baguette, jambon and bottle of rouge and little Louis braves his first “merci, Madame” A few hours ago we were on a suburban London train, now we are cycling into a forest in Versailles, with baguette in pannier. Eat your heart out, Walt. 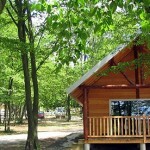 The wooden chalet is perfect, neatly nestled into the forest environment, and is better equipped inside than our own home. I warm my out of condition cycling muscles by the wood burning stove and wait for the expresso maker to bubble on the gas one. Louis makes himself at home in his little mezzanine den with a secret stock of those delicious French crisps while I set up our picnic on the decked terrace. This is a real campsite with ‘proper’ campers and tents, but I suffer no guilt here for taking the easy way out. Cycling to Paris is one thing, but taking a tent and all the gear was out of the question. Revived and rejoicing in this secret hideout, we jump back on our bikes in search of Louis’ namesake’s Chateau (and ice cream). We didn’t get very far, though. The campsite’s swimming pool was blue, shimmering and empty, with enough steam rising into the cooling September air to reassure me that it was heated. I reminded myself that a swimming pool would always have taken precedence over a Chateau when I was seven and, after all, I had denied him Disneyland. We dive in and amuse ourselves endlessly diving for the acorns which were starting to fall from the trees around the pool. Dressed and back in the saddle, we are distracted by an intense game of boules between two ten year old French boys. They ask Louis to join in, and shyly he agrees. French lesson number two complete. Boules turns to table football, then to table tennis under the trees and as they run to the climbing frames I realise there is nothing to do but open that bottle of red. I overhear, “Je m’appelle Louis” and raise a glass to the best French lesson in the world. The Chateau is put on the long finger, but the day was not going to end singing songs around a campfire either. We sample the home-made delights of the campsite pizzeria, get back on the bikes determined to end the day in style. Dab hands at putting the bikes on and off the RER at this stage, we take a twenty minute journey following the Seine into the city centre. Emerging from the station Champs de Mars at dusk, Louis is dumbstruck as we turn the corner and there it is, poised elegantly right over our heads. The glorious Eiffel Tower must have held his silent smiling gaze for minutes. We lock the bikes, join the queue and decide to take the lift to the second floor. Seeing any cityscape from a height, and at night, is always exciting. But when the Eiffel Tower suddenly explodes into a cascade of white flashing lights, it is heart-stopping. Looking into the eyes of a loved one and seeing the reflections of this generous Parisian spectacle reminds me why this city seduces young and old. It was, I admit, a bit of a Disney moment. And so to the confessional – we never made it to the Chateau de Versailles. Cycling in the nearby forest, playing table tennis and boules became the dictating themes of this trip. On our last afternoon we took the bikes into Paris, and decided to explore by saddle. Bravo for a city that welcomes cyclists and closes several of its main arteries to traffic on Sundays. This traffic-free initiative is aptly called “Paris respire” or “Paris breathes”. We breathed in all the sites along the Seine, starting by the Louvre at the Quai de Tuileries, and continued down the Right Bank as far as, and imagine the excitement, Ile St. Louis for crepes. The bells of Notre Dame invited us to Evensong, where we briefly did our Sunday bit, before hitting the Left Bank. The art of free running or ‘parcours’ upstages the more traditional art in the Open Air Sculpture Park on Quai St. Bernard. We had our own private exhibition of athletic showmanship in this exquisite park before cycling the last few metres to Gare d’Austerlitz to take the RER back to the burbs of Versailles. Back at the cabin, wrapped up in blankets and drinking hot chocolate under the stars, Louis smiled and said, “Disneyland could never beat this, Mum”. I knew I had got even. As for the Chateau, it is, allegedly, round the corner. Luckily, the Easter holidays are too and Cabane number three has our name on it. 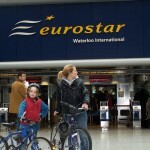 This entry was posted in Articles and tagged cycling, eurostar, huttopia, paris, trains, versailles. Bookmark the permalink.